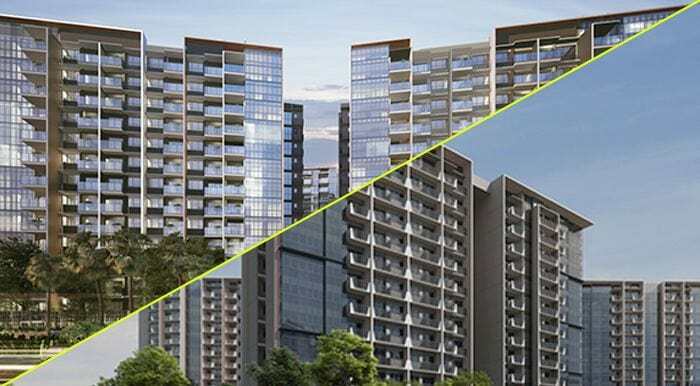 Despite being just a less than 500 metres apart, both The Garden Residences (by Wing Tai Holdings and Keppel Land) and Affinity at Serangoon (by Oxley Holdings) have been launched over the weekend, with each of these new launch condo projects garnering healthy sales. The 1,052-unit Affinity at Serangoon, which is due to be constructed on the site of ex-HUDC Serangoon Ville, have sold a total of 112 units out of 300 launched for sale. The former HUDC Serangoon Ville was sold to Oxley Holdings via en bloc back in July 2017 for $499 million (equivalent to $835 psf ppr). The development comprises 1-bedroom to 4-bedroom plus study apartments and the units were selling at an average of $1,575 psf. It was also noted that 3 out of the 40 strata houses available in Affinity at Serangoon were also sold over the launch weekend. On the other hand, The Garden Residences (being built on a government land sale site) have also sold more than 60 units during its initial launch, with an average selling price of $1,660 psf. Among the 613 units constructed, The Garden Residences comprises of 1-bedroom to 5-bedroom units types. Keppel Land and Wing Tai acquire the Serangoon GLS site for $446.28 million, equivalent to $964.81 psf ppr back in July 2017 – just 1 day after Oxley Holdings snapped up Serangoon Ville. Other than the 519-unit Forest Woods by City Developments Ltd, there haven’t been many projects being launched in the Serangoon precinct over the last couple of years. And looking at the price movements, units at Forest Woods have been selling at an average of only $1,412 psf since October 2016 – which will seem like a great deal in terms of price and location when being compared to The Garden Residences and Affinity at Serangoon. When being asked about the slightly higher average price point of The Garden Residences as compared to Affinity at Serangoon, analysts commented that the site was acquired by KepLand and WingTai at 16% more than what Oxley Holdings paid for. On top of that, it could also be due to the fact that KepLand and WingTai are larger property firms with a much longer and impressive track record. In addition, market watchers believe that both groups of developers are likely to push out each project’s inventory sooner in order to avoid massive competition for many other projects which are due to launch later this year.